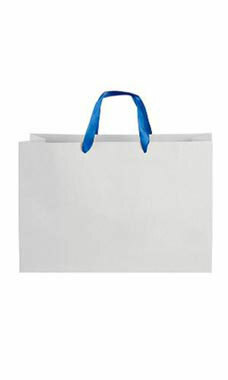 Large White on Kraft Premium Folded Top Paper Bags with Royal Blue Ribbon Handles are great for bigger purchases! All retailers can make use of this spacious, sturdy shopping bag. It accommodates multiple items and most apparel boxes. Each bag features royal blue ribbon handles, a gusset, and tear resistant white exterior and Kraft interior paper, making them a durable solution to your large retail packaging needs. Learn more about Fold Top Paper Bags in the Customer Connection section of our website. Plus, you can customize these premium bags with your logo or message. Visit our online custom configurator to get started Custom Bags.